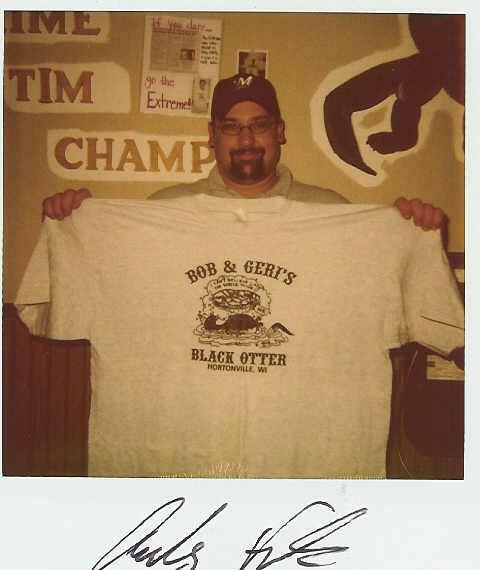 Saturday March 21st 2009 a Manitowoc man walked into Bob & Geri”s Black Otter Supper Club in Hortonville Wisconsin to take on the massive 160 ounce Extreme Cut Prime Rib in one of the wildest encounters of Man vs. Food ever to be witnessed. Having not visited the Otter in some time, it was our privilege and luck to walk in and catch this culinary challenge as it unfolded. 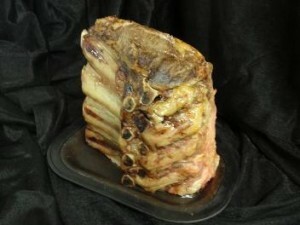 The Black Otter Supper Club has offered up prime rib challenges going back to the late 1980’s. Nearly twenty years ago a friend and I had taken on and tackled the tiny 104 ounce King Cut. We should have been numbers 19 and 20, but somehow we were not documented properly. We both still have the shirts as trophies. Having walking into about 3/4 of the way through, I walked up and introduced myself and told Andy that my friend and I had done the 104oz many years ago. He laughed and said he saw my picture on the website review and recognized us. We threw him some encouragement and advice and headed back to our table. 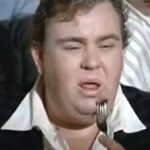 Even Hollywood movies have depicted legendary tales of Northern Wisconsin restaurants serving lumberjack sized steaks. Chet Ripley barely finished off the petite old 96’r. (The Great Outdoors, 1988) Over time these Paul Bunyan sized steak challenges come and go as do restaurants. 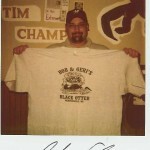 For many years the Black Otter has been “the” place for these Wisconsin sized beef challenges. In what might horrify fancy chefs whose restaurants serve 6 ounce Kobe steaks for hundreds of dollars, here in Wisconsin, the cholesterol challenge begins with quantity in the 100 ounce plus club. Over the years, the Black Otter has offered the 104 ounce King Cut, the 116 ounce Super Cut and 160 ounce Extreme Cut challenges. Grade unknown but the steaks are great. Awards: 2007, 2011, and 2012 Best of the Valley Post-Crescent Readers’ Choice Award Finalist for Best Steaks. Any Frank, Prime Rib King! at the time of this post, we didn’t have a photo of this bovine behemoth. Here is one from the Black Otter menu. Check out the current Hall of Shame. 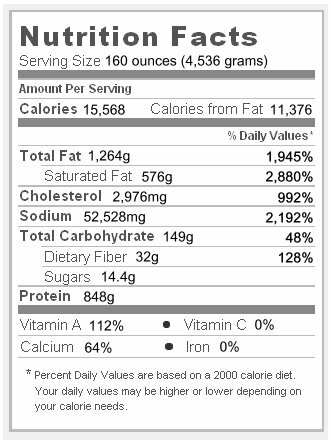 Well, we’ve boiled that down for you in the following nutritional facts label that should accompany the plate, along with a coupon for a free angioplasty.. These values were calculated using a 10 ounce serving data for Prime Rib Steak. Keep in mind, the 160 ounce Extreme cut is “bone in” and includes a pound or two of bone and fat which happily you do not have to eat. Watch Furious Pete Czerwinski break the world time record for downing a sizzling hot 72 ounce steak in 7 minutes, a total of 10 minutes for potato & salad. All calculations are based on nutritional data of a 10 oz portion and simply multiplied out. Calculations do not take into account extra bone or fat content. What an awesome effort. And then he ate the fries and salad. Unbelievable!!!! sorry Andy D. – picture is now posted for your viewing pleasure. Where are the pics of this gigantic piece of love?!?! Let me know when and where he’ll be doing that one… I’ll bring the video camera and document it! All hail Andy! We were there to witness the major meat masacre but Frank has other challenges in sight. A two-man pizza challenge is next on his list of "Man vs. ?" Hopefully there will be pictures to follow!